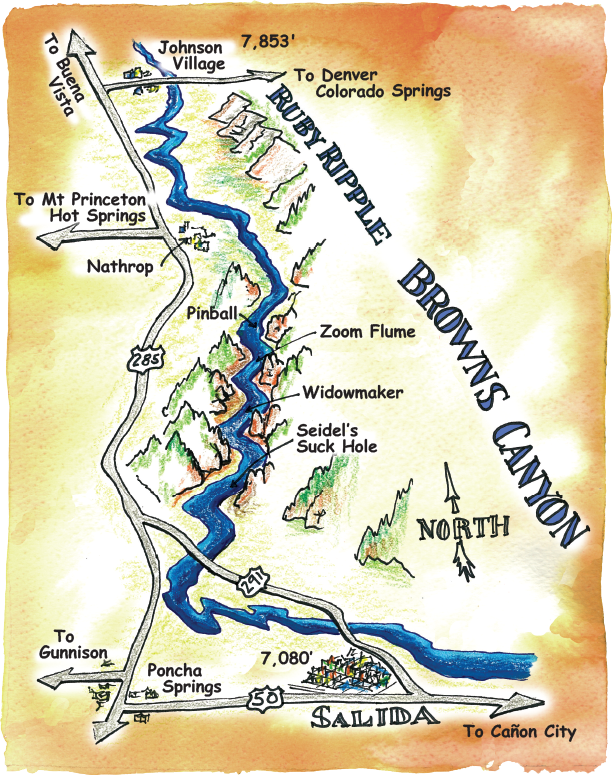 The summer of 2013 turned out to be a great year for rafting. After a couple of lean snow years, we had a very long and snowy spring which led to a very good season for our friends at Performance Tours. 2010 was a pretty rough year for rafting and competition amongst rafting companies was swelling. 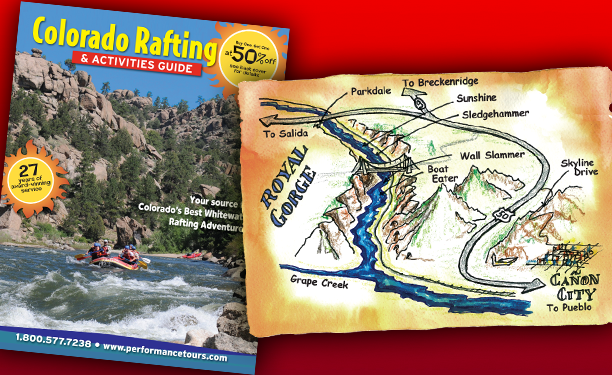 Kevin and Mary Jo Foley of Performance Tours turned to us to upgrade their brochure and to add some “animation” to the printed version of their rafting trips and to create some excitement. This project was a lot of fun for me. 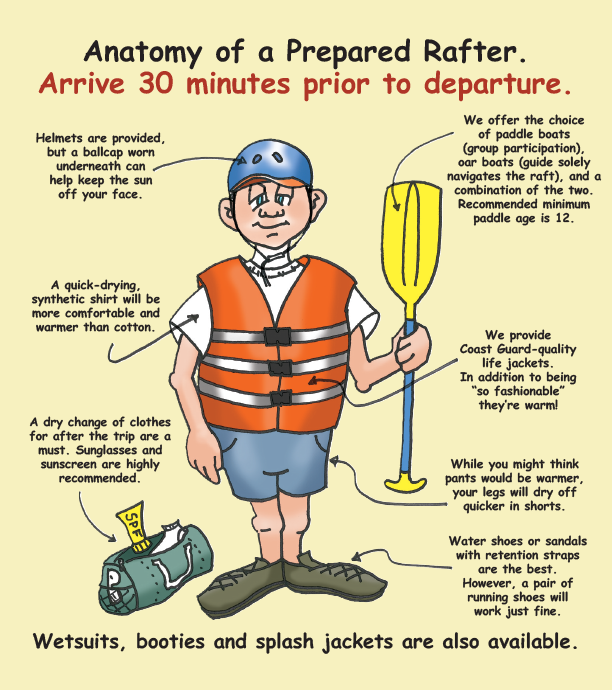 Although I’m not really a big “water-sports guy,” I have rafted many of these sections of river. 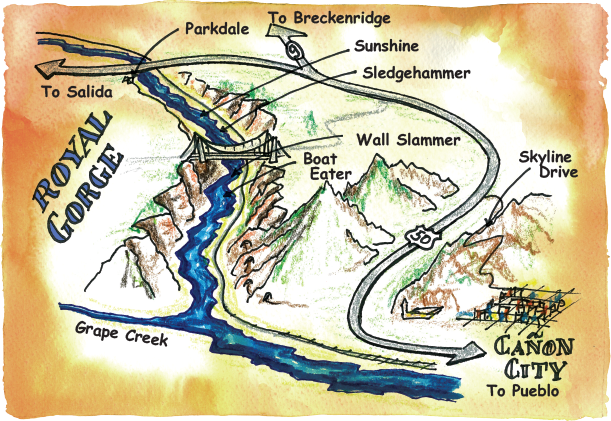 I’ve lived at the headwaters of these rivers most of my life; the terrain was familiar and is was a blast to illustrate them. We started with an overview map which shows the major rivers with some basic driving references. 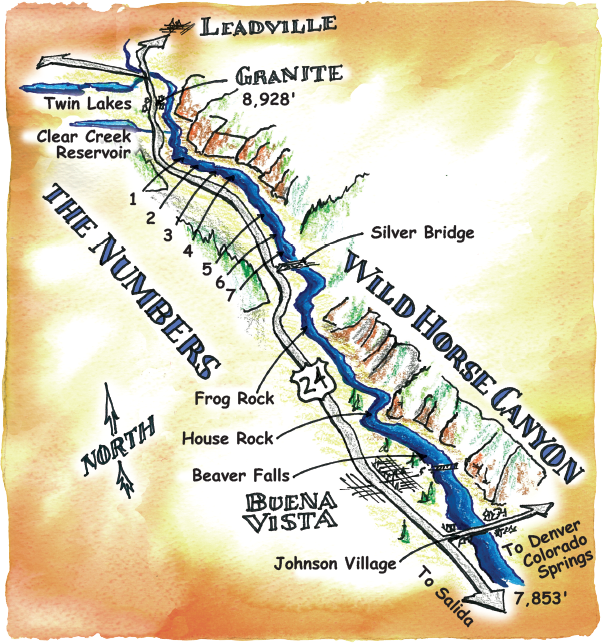 I was raised in Leadville, the headwaters of the Arkansas River. Just after Granite is a stretch called “The Numbers,” a section of class IV – V rapids. 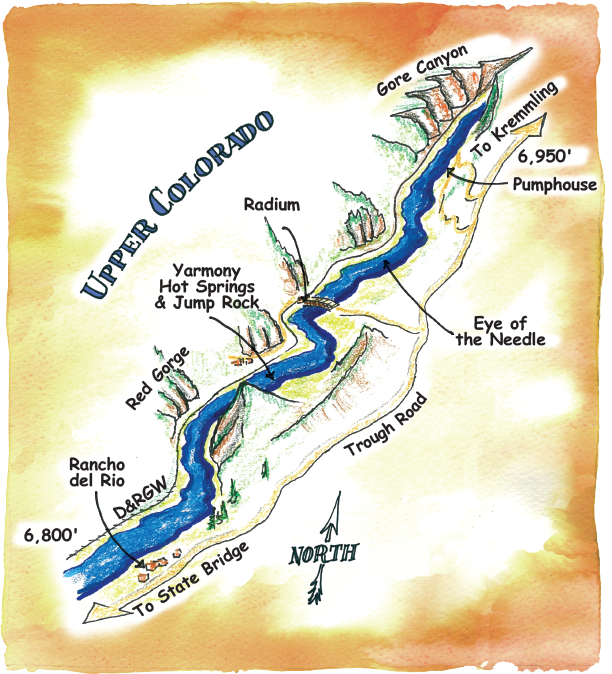 This is the most popular section of whitewater rafting in Colorado. This is a very beautiful gorge with class IV+ rapids. 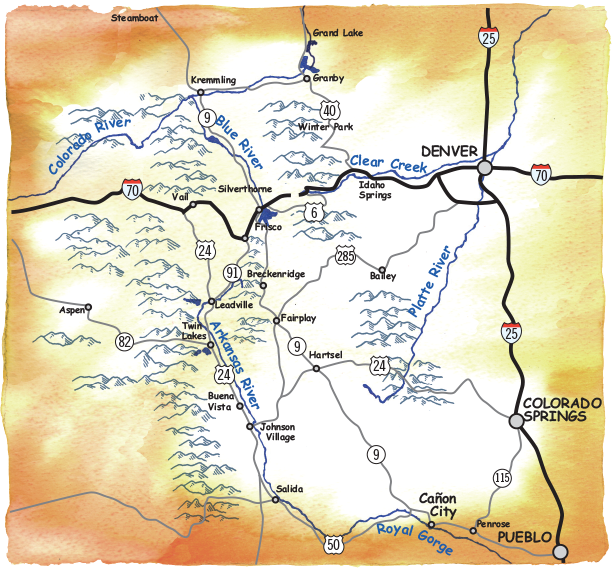 By the way, Cañon City is a fun place to visit: great hiking, biking, jeep roads to Cripple Creek, the Territorial Prison Tour, Dinosaur Depot, and friend of ours own the Royal Gorge Route Railroad which runs the length of the gorge—definitely worth it! This is also a very popular stretch of river, just minutes west of Denver. I currently reside on the Blue River, just above the Columbine Landing bridge. 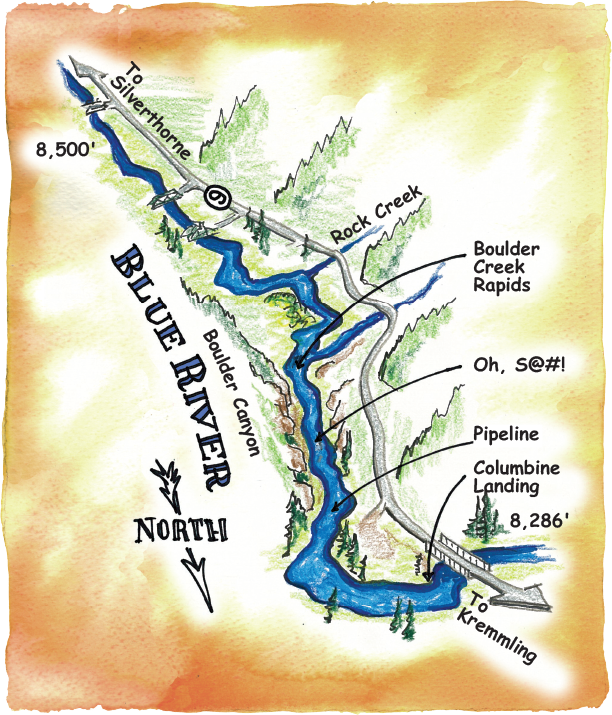 The Blue River then flows north of us to Green Mountain reservoir, then to Kremmling where it flows into the Colorado River. 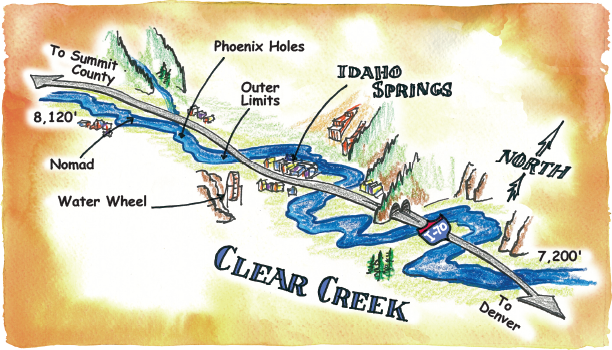 My first rafting trip was on this section in 1976 while attending Anderson Camp just outside of Dotsero. I remember it well, as I had broken my leg that winter and I was able to raft in a long, waterproof cast. Yes, I know I’m bragging about one of my clients. But Performance Tours have been running these stretches for 27 years, they really are pros!